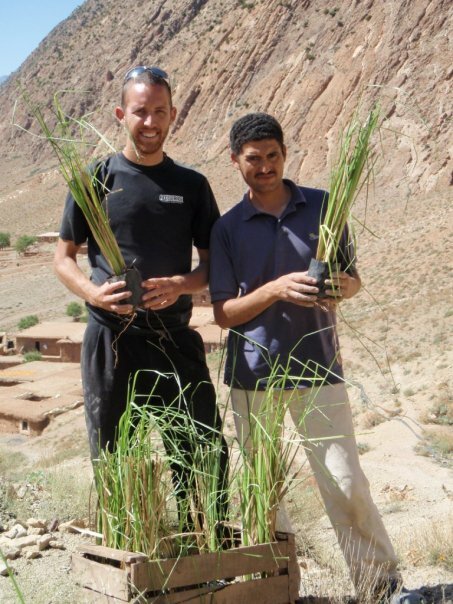 Dan and Brahim work on an erosion project in Ait Bougamez in 2009 supported by sales from Brahim’s woodcarving shop. This week marked a truly exciting milestone in Anou’s development: Brahim, Anou’s Director and artisan, has officially taken over the Anou’s operations in Morocco from me. This is a significant step as we work to make Anou a fully artisan run platform. Up until this point, much of my work focused on supporting our pilot group of artisans as we worked through the growing pains of Anou’s prototype phase. Now, Brahim will not only support existing artisans on Anou, but also take the lead outlining and pursuing Anou’s strategy as it expands its artisan network throughout Morocco. My role will evolve into a supporting role for Brahim and enable me to focus more on the messaging and marketing of Anou. I am confident that Brahim will succeed in his new role simply because he embodies Anou’s vision of empowering artisans in Morocco. For those who may be just learning about Anou, Brahim was my counterpart during my Peace Corps service from 2008-2010. Our work together outlined many of the challenges artisans faced in Morocco and it was Brahim who convinced me to return to Morocco to build Anou and fully address the challenges we identified. The decision to return to Morocco was easy because of Brahim’s belief that artisans could sell to global markets with independence, and most importantly, with dignity. Since we started early last year, Brahim’s belief in artisans proved to be much more than just words. Brahim, an apple farmer, has logged countless hours on the road away from his family, orchards and woodshop in order to become a reluctant leader for Anou’s vision in a culture that often shuns initiative. Most tellingly, he did all of this without pay. With Brahim’s resolve combined with our growing and talented team, I am certain that Brahim will not only do an outstanding job, but that the rest of 2013 will be an incredibly exciting time for Anou. Today, we’re excited to announce that we’ve officially transitioned from Anou’s prototype website and pushed products and operations over to an entirely new site now available at www.theanou.com. 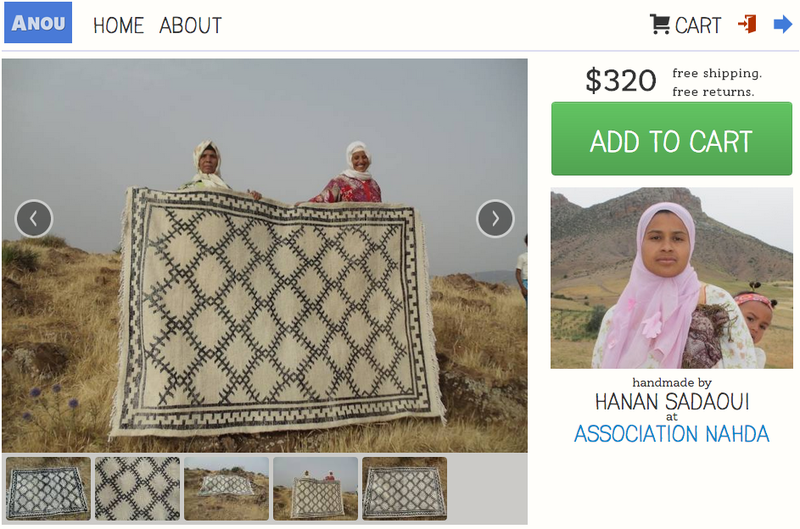 This change is the result of many hours of hard work transforming Anou to make it easier for artisans to sell their work independently online. These efforts were led by Tom Counsell, Anou’s Technical Director as together we reimagined the Anou platform. Many of the changes in our latest release are found on the artisan side of Anou. We’ve taken the countless hours spent observing artisans on the prototype site and created an experience that even illiterate artisans can master in a short period of time. We’ve done this by blending culturally responsive design with advanced web development practices so our platform can succeed on the oldest internet browsers in local internet cybers and outdated versions of Android that power an increasing amount of phones across Morocco. We are now proud to report that Anou works practically anywhere and on any device that Moroccan artisans have access to. We’ve also made many changes to the customer side of Anou as well. We’ve listened to a lot of feedback from our customers and created a new way to search through the products on the site, eliminated the need for customer accounts and also enhanced the site with responsive design so that it works on your computers, tablets and smartphones. While we are excited about these changes, we are even more excited about the new changes we have in the works for future releases. When these changes are introduced on the site, we’ll be sure to announce them here on our blog. Please let us know what you think by sending us feedback at hello@theanou.com and we’ll do everything we can to incorporate the best ideas. 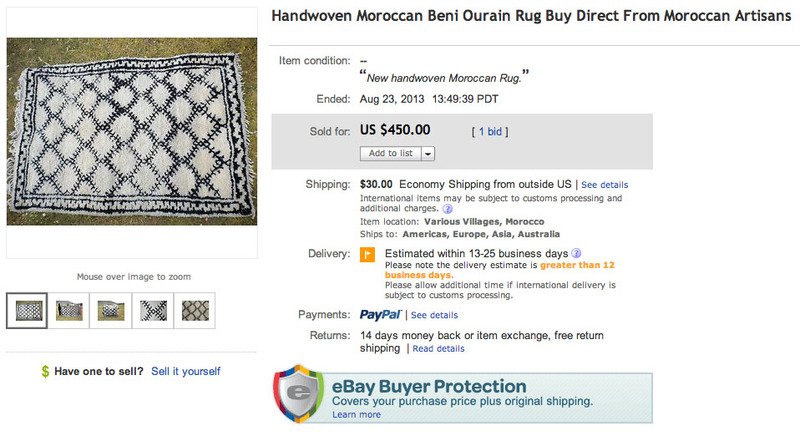 Thanks for your support as we continue to empower artisans to sell independently.